Oh, the joys of destruction! I would have LOVED this book if it had been around when I was in middle school. I was one of those thirteen-year-olds who was really into guided journaling (and unguided journaling, too, but I found that sometimes a little structure really got the creative juices flowing), and this book takes that concept to a whole new level. It’s not even really journaling, honestly. It’s more like guided mayhem. Which might be even better. 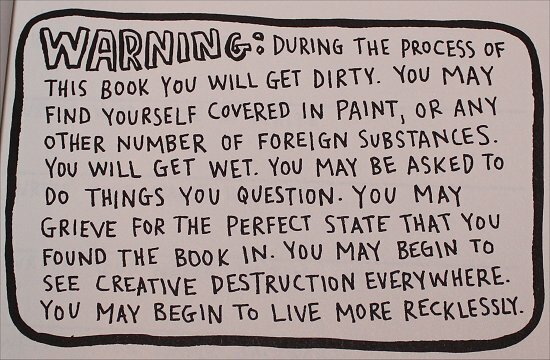 If you tried to make Wreck This Journal into an ebook, it’d be the last time you used your ereading device. Because, at least as far as I know, there is no ereader that can survive being chewed on, scribbled on, scratched, dropped from great heights, or used as a surface on which to collect dead bugs. And that’s just a fraction of what you get to do to this thing. Jump on it. 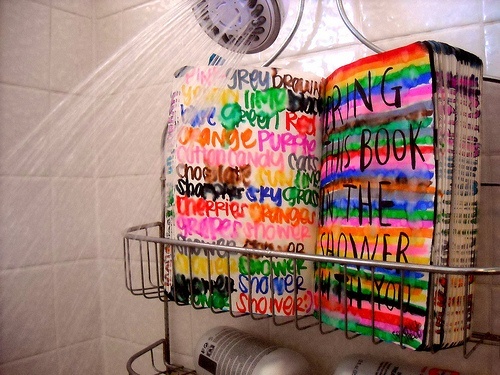 Bring it in the shower with you. Tie a string to it and drag it along on a walk. Tear out pages and give them away, or lose them. Turn them into balls, funnels, paper airplanes, paper chains. In other words, give in to your destructive impulses and watch them turn into creative ones. This entry was posted in February 2015 and tagged Books & Books, books you can do, destruction, february 2015, interactive books, journaling, journals, keri smith, wreck this journal. Bookmark the permalink.